On Thursday 13th July, in the warm atmosphere of a Neapolitan evening, the extravaganza caravane was introduced at Casa Morra with Gli Animali, a new iteration of Eddie Peake’s 2012 Touch performance: a naked soccer match, initially enacted by the artist as he was attending the Royal Academy, and which was again presented at Palais de Tokyo in 2015, with the title Duro. 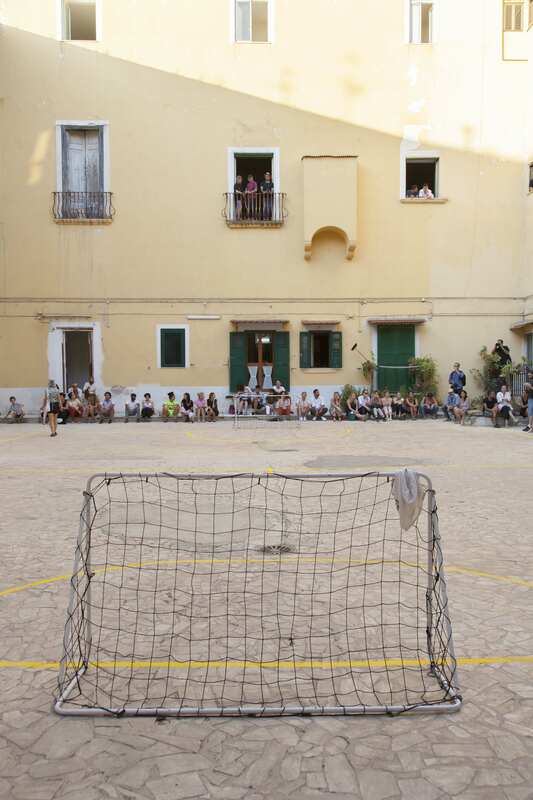 Gli Animali aims at engaging both players and viewers in the task of following the actual match and forgetting the lack of clothes, elaborating on the immediacy of a game situation, recreating a state of spontaneity similar to that of children, who would play regardless of their nakedness. Chosen as debut location for I Polpi, Casa Morra is a place of particular significance: the space belongs indeed to Fondazione Morra, an institution endemic to the city as per having brought to Naples iconic performances and avant-garde practitioners, to the likes of The Living Theatre of Julian Beck, Allan Kaprow’s Environments, Rhythm 0 by Marina Abramovic and 45.Aktion by Hermann Nitsch, just to mention a few. In homage to the latter, Peppe Morra also founded the Hermann Nitsch Museum.